Any airport around the world is filled with emotional people greeting or saying goodbye to loved ones. Calgary airport is no exception. The only difference is that the loved one you are saying goodbye to happens to be the Rocky Mountains. Why shouldn’t you be sad after visiting some of the most stunning towns in the world, let alone Canada? Bubbling Banff, Canmore and quaint Jasper are a few of the more popular towns but the choices will leave you with lots of nice decisions to make. However, before you get to these towns, it is likely you will have to fly into Edmonton or Calgary. So, how to get from the big smoke to some of the best skiing, hiking and biking around? Airport Shuttle or Car? 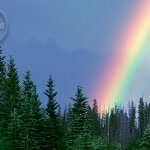 There is always gold at the end of the rainbow in Banff. Depending on who and how many you are travelling with, renting a car (or a limousine!) can be an economical and efficient option. Just like any other big airport, there is a host of companies to choose from in the arrivals lounge. Make sure to do your homework beforehand to see if they have a deal going with the airline you are flying with. As well as saving money, if you are going to be travelling around the Rockies’ towns a bit, then you can go at your own time and pace. Banff, Canmore, Lake Louise and Jasper are all excellently serviced from Calgary airport. There are a few different options to choose from so you will never be stranded. One option is the Banff Airporter shuttle which leaves at varied times during the day, dropping you to the door of your hotel. Jasper Vacations have a fantastic reputation in the Rockies with extremely friendly and experienced staff. As well as providing a shuttle between the airport and the Rockies, Jasper Vacations does tailor-made tourist tours so you can get the most out of your time by putting the experts in charge of transportation. In peak seasons, it is a good idea to book in advance as the beauty of Banff calls to everyone around the world. There are desks in the airport that can hook you up with a ticket before you can say “wow what lovely scenery!” In Calgary, once you leave the arrivals lounge, you should see each companies’ desks. If not, there are a bunch of white-hatted helpers who are there to help the new visitor find their feet after long, mind-numbing journeys. The drive to Banff from Calgary is only about 90 minutes and if you are setting up base in Canmore, 20 minutes less again. After sitting on a plane watching the latest Jennifer Aniston romantic “comedy” for several hours, it is a pleasure to sit back in the comfortable seats as you are shuttled past growing mountains, gleaming lakes and grazing animals. Welcome to the Rockies!